Coshocton Dentistry is a general practice meaning we do many different types of dentistry such as implants, cosmetics, and orthodontics. Because we do so many different procedures, it is essential that we keep up with the latest technologies. We've always thought that if you're not keeping up, then you're falling behind. We practice in a small community and sometimes access to medical care in smaller rural communities is scarce. So, we made it our mission to make sure that our patients can receive the same high technology services and techniques as anywhere else in the world could. We really pride ourselves on staying up to date with all the latest technology and advances that dentistry has to offer. This is called a Cerec machine and it's basically a CAD CAM machine that allows us to make dental restorations crowns right there in the office while the patient is in the chair. Without this technology, it would take us two or three weeks to complete a crown procedure. But, with the Cerec machine, we can do it in one visit over a period of one and a half to two hours. That is a huge convenience for our patients! This is our 3-D imaging machine, and this is really a game changer for us. Normal X-rays are just in two dimensions; they're flat. But, this machine allows us to see things in 3-D. So, we can see things and diagnose things that we've never been able to see before. Having this technology allows us to make a more accurate diagnosis and help our patient stay healthy and get the right treatment. At Coshocton Dentistry, we are proud to say that we are constantly keeping up with new and advancing technologies to provide our patients with the best dental care possible. If you have any questions about our technologies or how we are continually learning, contact us today! We all know the importance of a beautiful smile. Over the years, as technology advances, we have found that one of the best new ways to achieve that is what we call clear aligners. Clear aligners are a new way of straightening your teeth without having to use any metal wires like with traditional braces. We correct your teeth by using a series of clear removable trays that are very comfortable. They're easy to use, and they're very effective. In addition, they are less invasive compared to orthodontics and they are great because when you have them in most people can't even really tell that they're there. We can make your personalized series with our computer. Then you wear each one for about two weeks. Each tray moves your teeth approximately 1 1/2 millimeter. Each patient's treatment duration will vary, depending on how their teeth are positioned before the beginning of treatment. But, over a period of time, we can get your teeth into the desired position. Am I a Candidates for Clear Aligners? We have found that most of our patients who use clear aligners are patients didn't have the ability to get braces when they were younger, or they had braces and their teeth have since relapsed. However, we are happy to have you in for a complimentary consultation to make sure you're a good candidate for our clear aligners because there are some qualifiers. First off, your teeth must be healthy. We would not be able to use clear aligners on unhealthy teeth as it may further any issues you may be having. If you want to straighten your smile but don't want to worry about those pesky metal wires, then contact us today to see if you are a candidate for clear aligners! At Coshocton Dentistry we specialize in a variety of practices from cosmetic dentistry to regular cleaning. However, one thing we see in a lot of our patients is gum disease. This is a very common issue that many people have, and it can be very dangerous if not handled properly. Gum disease is a common infection which leads to soft tissue damage around your teeth. Eventually, this can cause tooth loss and in extreme cases, even death. Is it Normal for Your Gums to Bleed, Even a Little? Any kind of bleeding is not normal. If you brush your hair and you see blood, would you think that’s normal? Bleeding gums is a sign of bacteria that is not being brushed or flossed regularly enough. Once we notice that there is a gum issue, we suggest paying more attention to those areas and we will help with that. We can help you maintain the problemed areas and coach you on how to properly take care of bleeding gums. 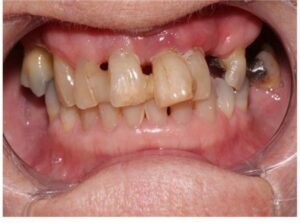 This patient has advanced periodontal disease which is an infection in their bone and gums as a result of plaque. The buildup of enough plaque can destroy the boning attachment around their teeth causing them to lose their teeth even though they may be healthy. A more common example of gum disease is gingivitis. 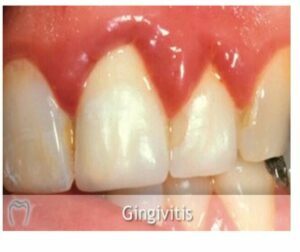 Gingivitis can develop as a result of stress as your body is not fighting off bacteria properly, or if you’re not cleaning your teeth and gums properly. If you are at risk of gum disease, we suggest you increase your frequency of appointments with us. We, even offer some other treatment services if necessary. Moreover, we may need to involve a specialist. Your gums are really the foundation of your teeth and without them, it's really a difficult process to restore them! That is why it is better to catch it early and never miss a cleaning! If you have any questions about gum disease or think you may be at risk of gum disease, contact us today! Coshocton Dentistry is a general dental practice where we can help you with any of your dental needs. However, one of our specializations is cosmetic dentistry. Cosmetic dentistry is becoming more and more popular over the last few years. As dental technology advances, it becomes more accessible and more affordable for everyone to get the smile they have always wanted. We even have many older patients come in, who have always disliked their smile, and we can make their long-lost dreams come true! There are many aspects of a smile we can alter with cosmetic dentistry. This differs from patient to patient, as it just depends on what they want as an end result. We can reshape, whiten, or straighten your teeth. The best part about cosmetic dentistry is the almost instant gratification you get from our advanced technologies! Don't Want to Get Orthodontics? You don't have to! If you have an uneven smile, and you don't want to wait months or even years for braces to straighten them out, you don't have to! There are other options such as veneers or crowns. The route you would go with will differ as every patient is different. Veneers come in either porcelain or resin. The difference is the cost and longevity of the material. If you are on a cheaper budget, but you want that instant gratification of a straighter smile, resin doesn't last as long as porcelain, but it costs much less. Above is an example of a patient who got veneers to change the color and shape of her smile! Do You Want to Change Your Smile with Cosmetic Dentistry? If you want to reshape your teeth or just a single tooth? Our doctors at Coshocton can help you! Want to get a whiter, brighter smile? Our doctors can help you! Want to change anything else about your smile, but you're not sure what the procedure would be or how much it would cost? Our doctors can help you! Every patient is different, whether it be your smile goals or your financial capability. We try to work with everyone! So, if you want to get the smile you've only dreamed of, then contact us at Coshocton Dentistry!